bloom daily planners creates inspirational organizational products. We hope our products inspire and empower others around the world to bloom into the best versions of themselves! 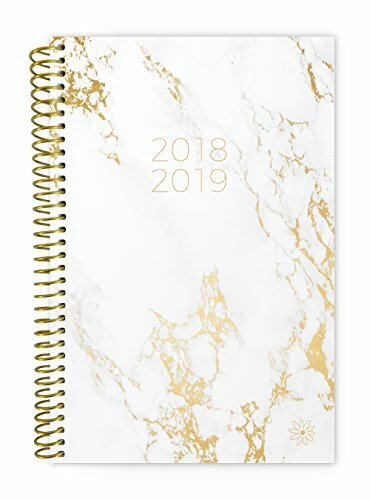 Check out our other planner sizes and layouts, planner accessories such as stickers and bookmarks, matching binders, notebooks, desk calendars, to-do pads and much more in our store by clicking "bloom daily planners" in blue under the listing title at the top of this page! Show us how you're blooming! Tag a picture with #bloomgirl or #plantobloom on social media! Thank you so much; we really appreciate your business!!! 2 page monthly overview spreads and spacious weekly views run academic year, August 2018 through July 2019 -- 365 days! Packed with extra resources to help you BLOOM this year: personal mission statement prompt and yearly goal setting page, weekly scheduling templates, major holidays list, 7 notes pages, 4 contacts/address book pages, inspirational quotes, monthly reflection questions, and more! If you have any questions about this product by bloom daily planners, contact us by completing and submitting the form below. If you are looking for a specif part number, please include it with your message.